Indoor pools are amazing. They allow you to swim year round, in all kinds of weather. A lot of people, however, do not realize how stylish they can be. That is why, before you begin work on your indoor pool, we want to spark your imagination and show some of the options available to you. If you have a room with a high ceiling, you may want to consider putting your indoor pool there. This will make your swimming space feel large and open, giving it a sense of grandness. High ceilings also spark a sense of creativity and freedom. No wonder this style is popular with artists and filmmakers! This rustic look is reminiscent of saunas and cottages. The wood creates a warm, cozy feeling perfect for a space with an indoor pool and hot tub. Now you can bring the countryside to you – no matter where you live! Want to bring the drama? Then this is the indoor pool style for you! By blending ornate patterns and colours, you can create a magical look sure to thrill you, your loved ones, and your guests. Make sure you have the time to perfect this design before you start construction, though, as it can tip over into becoming garish if not properly balanced. 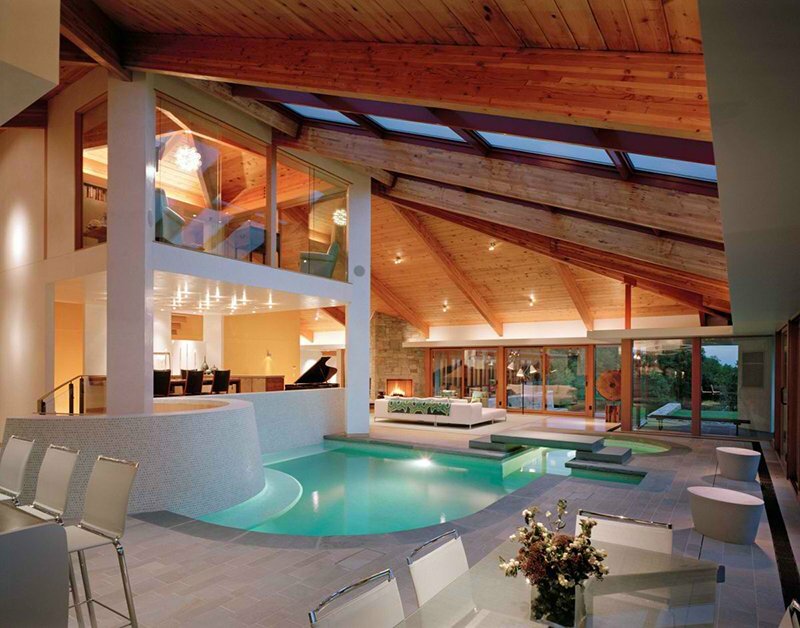 We love this indoor pool style. It is a little ‘70s, but still modern. Plus it has a unique shape and compelling features, including a small bridge over the water. Our favourite aspect, however, has to be the choice to include an indoor pool in a living room. This shows how you do not have to dedicate an entire room in order to have a pool in your home. This Japanese inspired style is a great way to create a relaxing atmosphere. While this example shows more of a plunge pool or hot tub size, you can also incorporate the design elements in a larger space. One of the additional pieces of inspiration here are the double doors leading straight outside. Open these to create an indoor/outdoor pool in the summer! Not sure if you want an indoor pool or a hot tub? Why not go for both? With a design like this one, you can have your main pool, as well as a hot tub, tucked to the side. If you want a more modern version, consider nestling your hot tub in more so that it almost appears to be part of the main pool. Moroccan design elements are always beautiful and chic. To bring a Moroccan look to your pool, think about adding colourful tiles and curved doorways. We also love the bed in this image. What a great way to create a lounge area in your pool room! Love going on vacation in tropical paradises? Bring the tropical paradise to you with this indoor pool design! You can include amazing landscaping features, such as live plants and rocks. Just make sure you know how to properly care for any plants you do incorporate into the design. Travel back in time with this indoor pool style inspired by Roman baths. If you want to go for a more toned down version, take an aspect – like the colour scheme. The other option is to go all out, embracing the look in all its ornate glory! This style is perfect if you love the ultra-modern look. The trick with a modern indoor pool is to choose every element carefully as each one will stand out. Colour is important, as are fixtures. Consider extras such as colour changing lights or an underwater sound system to make your pool truly one-of-a-kind. Not sure an indoor pool is right for you yet? Review our list of pros and cons before making your decision. Ready to move forward? Get in touch with us to make your indoor pool dream a reality.